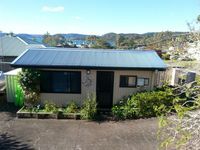 Property 3: Cute SARADISE COTTAGE......Saratoga, Central Coast N.S.W. Property 10: Enjoy a round of golf while staying in our cozy country cabin. The Cottage at Jacksons at Bundeena. Cozy garden cabin suitable for 2 guests. Property 14: The Cottage at Jacksons at Bundeena. Cozy garden cabin suitable for 2 guests. Property 34: Fisherman's Retreat or Family Getaway. Property 35: Coppin Cottage Country Retreat Mittagong Southern Highlands.